It was a clear day in Paris in 1838. Dressed in a coat and hat, a man walked towards the Boulevard du Temple. The thoroughfare bustled with horses and carts, as well as people going in and out of the shops, cafes and theaters. Unlike them, the man wasn’t in a hurry and stopped for several minutes to have his boots blacked. To him, it was an ordinary activity on an ordinary day. 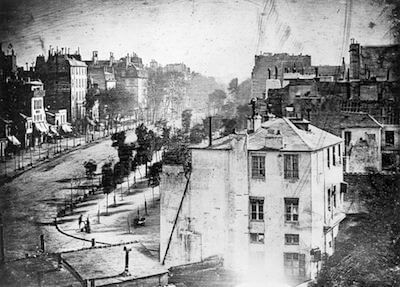 He never imagined that at that moment Louis Daguerre took a photograph, or a daguerreotype as his photos have come to be called, of the boulevard making him and the bootblack one of the first people to appear in a photograph. In those early years, only a few inquisitive people owned a camera and these were usually homemade affairs consisting of a box with a simple lens or even just a hole to let light in. These budding photographers treated paper, leather, glass and shiny pewter with silver nitrate, bitumen and other light-sensitive compounds to make photographic plates that would capture images. Many of their photographs actually worked, but quickly faded when they were taken out of the camera. Their successes and failures gave birth to photography and cameras as we know them today. In the latter part of the 1800s, photographers joined forces with chemists to improve the photographic process. Henry Fox Talbot, a British scientist, made a great advance by inventing the calotype process. This process proved that a faint or even invisible negative could be developed into a photograph using chemicals, in Talbot’s case gallic acid and silver nitrate. Photographs that used to require hours of exposure time now only needed minutes. In 1884, George Eastman from New York made the process even more practical by creating a light-sensitive, dry gelatin that could be spread on paper. This film quickly replaced the bulky photographic plates and Eastman founded the Eastman Kodak Company, the first company to mass-produce photographic film. 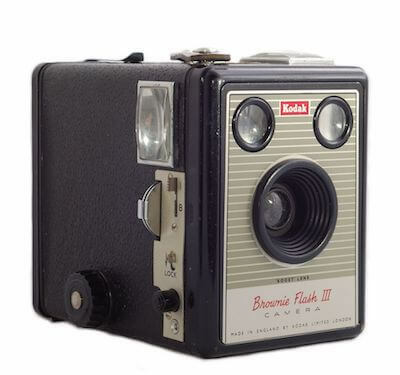 George Eastman eventually hired Frank Brownell to design cameras that used Kodak film. Their first cameras catered to professional photographers, but as the turn of the century approached, Brownell set to work on a camera that would be affordable and practical for the general public. Kodak launched the BrownieB, a rectangular camera with a simple lens and a built-in roll of film, in February 1900. Thanks to its price tag of only one dollar, 150 thousand people bought a Brownie the first year and soon there were amateur photographers everywhere. The Brownie didn’t monopolize the camera market for long. Twelve years later, a German industrial designer by the name of Oskar Barnack reduced the size of film to 35mm and designed a camera that could be easily held in both hands. Although World War I stalled the production of Oskar’s Leica camera, they sold rapidly once they began coming off the assembly lines and paved the way for many other smaller and lighter cameras. 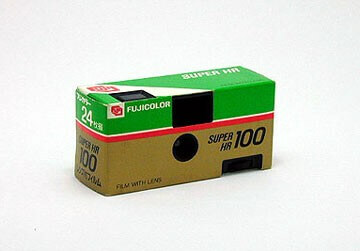 Other manufacturers, such as Contax, Fuji and Konica, began making cameras and each one brought changes to photography. Contax added a viewfinder to their cameras in 1948, Konica introduced autofocus in 1978 and innovative Fuji produced a disposable camera in 1986. Polaroid gained experience over time and in 1972 they began producing film with fourteen different layers, which included a square white base, various light-sensitive layers and all the chemicals necessary to instantly develop the photograph. Polaroid cameras traveled around the globe, popped up at a myriad of family activities and immortalized innumerable precious moments and in any case the photographers, whether professional or amateur, could enjoy the thrill of watching their pictures gradually develop in their own hands. After the photograph emerged from the camera, the photographer would wait about one minute and then peel away the developing agent to reveal the photograph. Polaroid gained experience over time and in 1972 they began producing film with fourteen different layers, which included a square white base, various light-sensitive layers and all the chemicals necessary to instantly develop the photograph. Polaroid cameras traveled around the globe, popped up at a myriad of family activities and immortalized innumerable precious moments and in any case, the photographers, whether professional or amateur, could enjoy the thrill of watching their pictures gradually develop in their own hands. From the time of the Brownie up until 1995, the vast majority of cameras used film and drugstores, supermarkets and camera shops generated income by developing film into photographs. This began to change, though, when Steven Sasson an engineer at Eastman Kodak began tossing around ideas for a camera that would use the recently invented charge-coupled device to transform light into electrical impulses. He publically announced his first electronic camera in 1975. It was large and weighed about 8lbs, but it successfully took monochrome pictures and recorded them onto a special tape. Other prototypes quickly followed Sasson’s camera and these proved their worth in both military and scientific settings which encouraged camera manufacturers to continue investing in digital technology. That same year Bell Laboratories fine-tuned the charge-coupled devices or CCDs which opened the door for pictures with a higher resolution, as well as for video cameras and television broadcasting. Bryce Bayer also developed a color filter which made it possible for one image sensor to capture all the colors in the visible spectrum. Interestingly, both Bell Lab’s CCD technology and Bayer’s color filter continue to be used in digital cameras today. No one minded that it had only 1MB of internal memory and a resolution of only .08 megapixels, because they had nothing to compare it to. The digital cameras which succeeded the Dycam I gradually became smaller, more powerful and multifunctional, allowing the photographer to take either still pictures or record a video. Digital technology relentlessly took over the camera market and film photography became obsolete. Adam Kontras made a video in January 2000 telling his family and friends that he would be moving across the country and posted it to his blog. 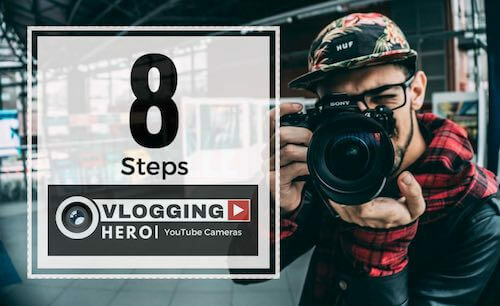 Others followed suit and began posting videos instead of text to their blogs, including Steve Garfield who possibly coined the word vlog when he affirmed that it was “the year of the vlog”. In 2005, Chad Hurley, Steve Chen and Jawed Karim encouraged vlogging by creating YouTube, a video platform where people could upload and watch videos. YouTube grew quickly and in a little over a year, users were uploading 65 thousand videos and watching over 100 million videos every day! Vlogging began as a way to communicate with those around us and it continues to do that effectively, but it has also become a way to earn a living. Vloggers and other YouTubers can invest in their video content, attract a sizeable audience and then be paid to feature products and give their opinions. This hunger to be successful is why there is such an importance to find this year’s best vlogging camera to join the ever growing multi-millionaire vloggers who just film what they love. According to Vloggers and other YouTubers can invest in their video content, attract a sizeable audience and then be paid to feature products and give their opinions. Thanks to platforms like YouTube there are vloggers who earn several million a year. I expect that Adam Kontras didn’t realize that his simple action of posting a video to a blog would play a key part in changing the world much like the man who unsuspectingly stepped into a daguerreotype in 1838.